If you walked into my kitchen you would see about a dozen magazines and recipe books on various counters. Some are opened, and I think all are marked with recipes I would like to try today, tomorrow, or when ever I can fit it in with out the oven running too much since it is so hot outside right now. Today, the lemon/lime bars won out. 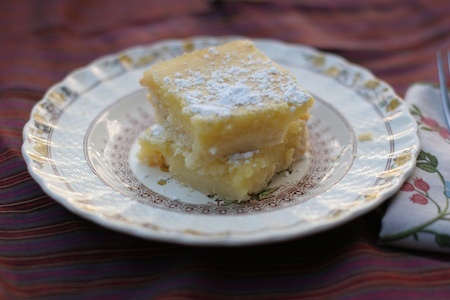 Many reasons to love the lemon bar. 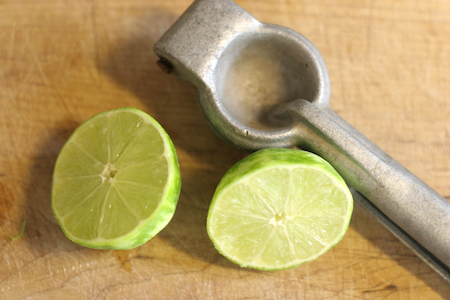 Obviously since they are a bar, you only have to pour and bake just 2 or 3 times, using the same bowls and dish makes clean up fairly quick, and who can ever have enough lemons and limes in the summer? And just this morning I found a new food blog and recipe worth giving a go. To make the crust: sift the confectioners’ sugar into the bowl of a stand mixer fitted with the paddle attachment. Stir in the flour. Add the butter and beat on low speed just until a smooth dough forms. Bake the crust until it is a deep golden brown, about 30-35 minutes. Once the crust is ready pour the filling directly into the pan (leave the pan in the oven while you do this to make it easier*). Reduce the oven temperature to 300 degrees F. and bake just until the center of the custard is set, about 30 to 40 minutes. *I should have left the pan in the oven while pouring because a bit spilled over as I was putting it bake into the oven. We had lemon bars a couple of weeks ago at a family get together that were more cake like and Mat loved them. So off to find a new recipe more cake-like and less shortbread. If you bake a bar that fits the above description I would love if you would share it.